Full time; International Degree Programme taught in English; Dual degree programmes. The purpose of HBR Master is to train highly specialized professionals, with skills suitable for performing and directing the planning, for doing coordination and control activities within the historic buildings rehabilitation processes. The most important job opportunities for HBR Master graduates are: technical Officer of Public Enterprises and Entities; technician of construction companies specialized in consolidation and rehabilitation of historic buildings; technician of private enterprises in the field of diagnostics and surveys. Completion of the HBR Master’s degree can also lead to entering PhD. level studies. For Non-EU citizens, an annual quota of places is set each year by the University of Bologna. For the Master Degree Programme in Engineering of Building Processes and System, curriculum Historic Buildings Rehabilitation, in the academic year 2018/2019, a maximum of 40 Non-EU students will be accepted. Please note: no entrance exam and Italian proficiency test is required for the Master Degree Programme in Engineering of Building Processes and System, curriculum Historic Buildings Rehabilitation. The need to improve existing buildings for new purposes, and the importance of architectural heritage conservation, are becoming issues of great importance around the world, in the field of rehabilitation of historic buildings. The growing cultural value attributed to the existing building and the economic and environmental benefits associated with its conservation are two crucial topics on this field. Moreover, high-profile skills are required, in order to meet its specific characteristics and constraints. The HBR (Historic Building Rehabilitation) Programme is an international curriculum of the Masters in Engineering of Building Processes and Systems. It is designed to meet the needs of new professionals, focusing on the critical analysis of the historical heritage, the diagnosis of conservation conditions, the definition of procedures and techniques for consolidation and rehabilitation, by applying new methods and solutions, compatible with the protection of the heritage characters. The programme is a two-years Master, the courses provided in the first year, are mainly oriented to address basic knowledge on conservation theory of historic buildings, materials and technologies, mechanics of historic masonry and wood structures. In the second year, both compulsory and elective courses are provided on specialized topics, such as Structural Diagnostics, Seismic Assessment and Rehabilitation; Geotechnical Engineering for the Preservation of Historic Buildings; Mineralogical and Petrographic Characterization of Natural and Artificial Stone Materials. HBR Master Students have the opportunity to obtain a double degree with Tongji University, Shanghai, China (MSc in Architecture and Civil Engineering). 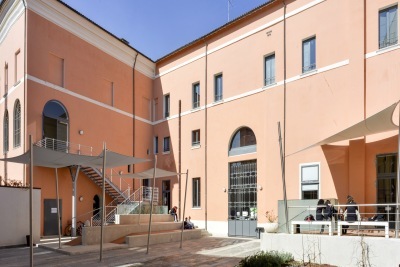 The first decentralized secretariat of the University of Bologna opened at Ravenna on 3 November 1986 and in 2001 the Ravenna Scientific and Teaching Centre was created as part of the Multicampus Project by Bologna University to spread its programme catalogue wider and set up stable research links across the territory. The Ravenna Campus research activities and programme catalogue have been gradually characterized by its own local features and vocations: the conservation and preservation of cultural heritage and the environmental science fields. The programme catalogue offers 16 degree programmes: 7 first-cycle degrees, 6 second-cycle degrees, 4 international second-cycle degree and 2 five-years single-cycle degrees. Moreover, the Ravenna Campus is equipped with advanced research facilities and expertise offering top-ranking scientific and professional education in several areas of learning. The Ravenna Campus brings you a lively university scene with roots that go deep into the local territory, and a town that welcomes you with its wealth of history, culture and art.